The country is opening up its economy to foreign investors. The country’s total trade volume reached US$8.87 billion by July 14, up by US$1.32 billion from the same period of last year, according to the Commerce Ministry. With the nationwide power supply network far from reaching small localities across Myanmar, projects to set up “mini grids” for villages are gaining traction. The government has recommended over 1,000 domestic small and medium-sized enterprises (SMEs) to receive loans from banks, according to the Central Department of Small and Medium Enterprises Development (CDSMED). The government has invited entrepreneurs to cooperate in implementing projects for housing covering the needs of staff accommodation, residential renters and would-be occupants of low-cost homes across Myanmar. The government has signalled its latest measure to boost the country’s agriculture and husbandry industries by offering loans to farms and lifting the ban on livestock export, according to the Ministry of Planning and Finance. Bangladesh and Myanmar are exploring a trade deal involving 300,000 tonnes of Myanmar rice, according to a report in yesterday’s edition of the Myanma Alin Daily newspaper. The Myanmar Agricultural Development Bank will provide loans for farmers to buy agricultural equipment and help with the competitive selling of agricultural machinery, the Ministry of Planning and Finance said. Maungtaw District in Rakhine State is gaining economic success with its marine shrimp breeding, exporting most of its marine shrimps to the neighbouring country, according to an official of the district fishery department. Mandalay launched last week its e-Mandalay Web Portal, which covers public services for 74 departments, said the chair of the e-Government implementation committee. The government was set to conduct a study to explore the tourism potential of Manaung Island in Rakhine State, said Union Minister for Hotels and Tourism U Ohn Maung. The HCM City-based Saigon Plant Protection JSC (SPC) has recently opened a representative office in Myanmar, after obtaining a local licence earlier this year. 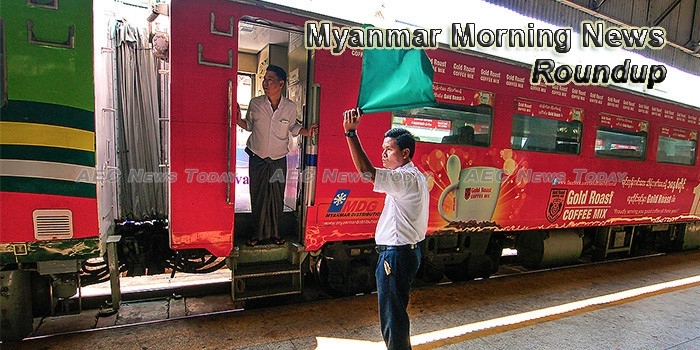 Myanmar Motor Corporation Public Company Limited (MMC), a Yangon-based company that plans to operate a $10-million bus assembly and production facility, is keen to rope in overseas investors by divesting 50 per cent stake in the venture. For the first time since the National League for Democracy was elected to parliament in the 2012 by-election, an NLD lawmaker has resigned from the party, citing a lack of freedom. Thirteen people have contracted A (H1N1) influenza in Yangon and Chin State’s Matupi Township, with one thought to have succumbed to the virus, according to the Ministry of Health and Sports. Rising floodwaters have swallowed a Buddhist pagoda in central Myanmar and sent tens of thousands fleeing their homes, as the government warned of more heavy rains ahead. Violence against the Rohingya Muslim ethnic minority by Myanmar’s military continues despite international calls to end persecution, a sign that the armed forces still hold great sway even under a civilian government. A cluster of villages near Yangon has emerged as an elephant poaching hotspot, with some accusing local police of underreporting the problem.